From now on, students and researchers from the Computer Science Department of FCT NOVA will be able to develop projects related to OutSystems' low-code technology, with the support of a team of specialists. The NOVA LINCS / OutSystems Collaborative Research Laboratory, launched on February 26 at FCT NOVA's Department of Informatics (DI) facilities, opens a new phase in the 10-year partnership for research, training and innovation among these institutions. 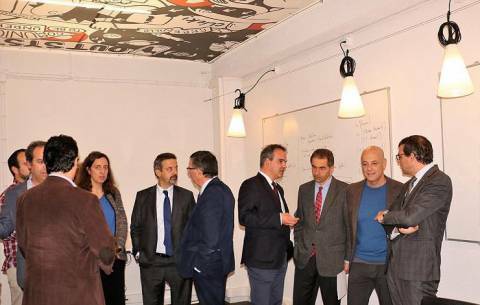 The event was attended by Minister of Science, Technology and Higher Education, Manuel Heitor, who provided the success of this collaborative research initiative, and Paulo Rosado, CEO of OutSystems, who highlighted the unique success of this partnership with FCT NOVA. to the future of building IT systems. "The Laboratory, fully equipped by OutSystems, will allow researchers and students of the DI / NOVA LINCS (Integrated Master in Computer Engineering, PhD Program in Computer Science) to develop projects related to OutSystems' programming technologies and systems, in collaboration with experts OutSystems R & D team, NOVA LINCS researchers and students" said Luís Caires, President of the Department and Director of NOVA LINCS. "Over the ten years of the partnership, OutSystems and ID have deepened an atmosphere of remarkable alignment of innovation activities, fundamental research and advanced training, which strengthens and strengthens all partners around issues of high technological potential," he said. João Costa Seco, researcher at NOVA LINCS. Also present at the session were the Rector of the NOVA University in Lisbon, João SàÁgua, the FCT NOVA Director, Virgílio Machado, teachers, students, researchers and staff from DI / NOVA LINCS and OutSystems.